Osteopetrosis is a rare inherited disease, characterized by increased bone density. The cause is in disturbed bone resorption. Osteopetrosis is divided into three groups according to the severity of its clinical presentation. There are malignant, intermediate and benign variants of the disease. Each variant is associated with the corresponding genetic basis. Depending on the symptoms, autosomal recessive osteopetrosis (ARO) is considered to be malignant or intermediate, and autosomal dominant osteopetrosis (ADO) - benign. Human osteopetrosis is thought to be connected with mutations in at least 10 genes. The most common of them are CA2, CLCN7, TCIRG1, PLEKHM1. In Russia, the endemic areas of osteopetrosis are the Chuvash Republic and the Mari El Republic where mutation 807+5 G>A of the gene TCIRG1 is the most common. The “Chuvash” variant has a milder presentation. A 6-year-old boy who had pancytopenia, descending degeneration of the optic nerve, mental retardation and short stature was referred to the Federal Centre for diagnosis. The plan of further examination included complete blood count, biochemical blood tests, coagulation tests, chest x-ray, chest CT, genetic counseling, and trepanobiopsy of the bone marrow. According to the results of the examination, autosomal recessive osteopetrosis was diagnosed. The most frequent mutation typical of the Russian population (c.807+5>A) in TCIRG1gene was not detected. Allogenic bone marrow transplantation was carried out from an HLA-identical donor. There were no side effects during myeloinfusion and after transplantation. The bone marrow was fully regenerated. There are no symptoms of the disease nowadays. Recognizing a disease can be really challenging in such cases. This case is the one of the examples of difficult and time-consuming diagnosis. This Caucasian boy was not born in the endemic region and is not of Chuvash or Mari ethnic origin. The typical mutation for ARO in Russia (c.807+5>A in TCIRG1gene) was not found. Thus, this case of ARO is considered to be unique. Osteopetrosis is a rare inherited disease, characterized by increased bone density. The cause is in disturbed bone resorption. This is due to the genetic defects in the intracellular pathways in osteoclasts [1, 2]. The overall incidence of osteopetrosis is estimated to be 1 in 100-200 thousands of newborns. But the disease frequency varies in different regions. The disease is more frequent in Chuvash and Mari El Republics of Russia. The incidence is 1:4000 in Chuvash Republic and 1:14000 in the Mari El Republic. Very ancient ethnic groups with great genetic luggage live in these areas, so the residents are more expected to have different defects in their genome. Thus, the Chuvash and Mari people have fault in DNA sequence connected with proteins taking part in resorption . Osteopetrosis is divided into three groups according to the severity of its clinical presentation. There are malignant, intermediate and benign variants of disease. Each variant is associated with the corresponding genetic basis. Depending on the symptoms, Autosomal recessive osteopetrosis (ARO) is considered to be malignant or intermediate, and autosomal dominant osteopetrosis (ADO) – benign. ARO is characterized by neonatal onset with great likelihood of death within the first year of life. The disease begins with compressive neuropathies, such as neurosensory deafness and optic nerve dystrophy, hypocalcaemia with attendant tetanic seizures, and severe bone marrow failure (anemia, thrombocytopenia, leukopenia). ARO is a life-threatening condition . On the contrary, ADO, which appears in late childhood or adolescence, has rather mild and benign clinical presentation. It shows the radiographic sign of "sandwich vertebrae" (dense bands of sclerosis parallel to the vertebral endplates). Common manifestations are pathological fractures, scoliosis, hip osteoarthritis and osteomyelitis, but in some cases the disease can be asymptomatic. Human osteopetrosis is thought to be connected with mutations in at least 10 genes. Proteins encoded by these genes play an important role in osteoclast intercellular pathways which are essential for bone resorption. Different authors and researchers expect various genes to be affected, but some genes such as CA2, CLCN7, TCIRG1, PLEKHM1 are indisputable . The CLCN7gene encodes proteins of the chloride-channel on the membrane of osteoclasts. Mutations in the CLCN7 gene are connected with 75 percent of ADO cases, 10 - 15 percent of ARO cases and all cases of intermediate form . The human A3 subunit of the osteoclast H+–ATPase proton pump is encoded by the TCIRG1gene. The normal structure of proton pump is essential for acidification, the process that induces mineral matrix resorption and activation of the enzymes responsible for the organic part destruction. Mutations in the TCIRG1gene are responsible for about 50 percent of ARO cases. Genetic testing shows that mutations in other genes are less common. It is worth noting that there is no genetic basis in about 30% of cases . In Russia, the endemic areas of osteopetrosis are the Chuvash Republic and the Mari El Republic, where mutation 807+5 G>A of the gene TCIRG1 is the most common. Mutation in this gene is known to be connected with about 60% of patients with severe autosomal recessive osteopetrosis. Although this genetic type of osteopetrosisis is characterized by visual impairment, frontal bossing, hepatosplenomegaly, hypocalcemia and death in first decade, the “Chuvash” variant has a milder presentation. Life expectancy is 6-8 years without treatment, so it’s possible to observe radiological presentation which is common for benign form of the disease [3, 7, 8]. Our patient is a 6-year-old boy, who was presented to the ambulatory department of the Federal Research Centre of Pediatric Hematology, Oncology and Immunology with complaints about asthenia, pallor and liver enlargement. This boy was born in a Russian family from the Chelyabinsk region (The South Urals, Russia). It is known that the child has been ill since birth. It was noted that the boy had persistent pancytopenia, hepatosplenomegaly and 7% of blasts in the peripheral blood. In connection with it, the child was followed up by a hematologist at the regional hospital. The patient received transfusions of packed red blood cells, platelet concentrate, and fresh frozen plasma repeatedly. Bone marrow studies were conducted several times, but no changes were found. Within the first year of life the patient was operated on for congenital glaucoma; the histological examination of the spleen was also performed, where the signs of intravascular hemolysis and the foci of extramedullary hematopoiesis were found. Later the following associated pathology was found: descending degeneration of the optic nerve, mental retardation, short stature of mixed type. The boy was examined by geneticists repeatedly for differential diagnosis of genetic diseases: Gaucher disease, Niemen-Pick disease, cystic fibrosis, mucopolysaccharidosis type I and II. No diagnosis was confirmed. Splenomegaly was increasing progressively. At the age of two it was decided to perform a spleen removal. Immunophenotyping didn’t provide any reliable data for lymphoproliferative process. The boy received several courses of Prednisolonum. Eventually, the presumed diagnosis of the myelodysplastic syndrome was established. The patient was hospitalized in order to establish a confirmatory diagnosis and determine further tactics of treatment. The plan of further examination included complete blood count, biochemical blood tests, coagulation tests, chest x-ray, chest CT, genetic counseling, trepanobiopsy of the bone marrow. Table 1. Complete blood count of the patient. The bold numbers represent values outside of the normal reference range. Based on the results of the complete blood count test, anemia, thrombocytopenia, neutropenia were diagnosed (Table 1). Besides, there was an obvious lymphocytosis. Table 1. Biochemical blood test of the patient. The bold numbers represent values outside of the normal reference range. The biochemical blood test of the patient showed an elevated level of total bilirubin mainly owing to direct fraction (Table 2). The levels of cytolysis enzymes (ALT, AST, LDH) were elevated considerably. Figure 1. X-ray of the chest in the frontal view. It was impossible to perform the chest Х-ray assessment of the lung fields because of the increased density of bone structures (Figure 1). The results of contrast-enhanced chest computer tomography showed diffuse induration of the bone tissue (Figure 2). Rounding and enlargement of the epiphyses and the absence of the bone marrow channels were also detected. The cortical layer was not differentiated. The multiple enlarged lymph nodes accumulated the contrast agent. Trabecular bone tissue with the features of massive osteosclerosis and osteopetrosis was presented for the trepanobiopsy. The isolated osteoclasts and the several clusters of the osteoblasts were visible. Intertrabecular spaces were replaced with the bone tissue; there was no hematopoietic tissue. This morphological feature could be presented by such diseases as osteopetrosis (Albers-Schonberg disease), hypervitaminosis of vitamin D, hypoparathyroidism. Figure 2. 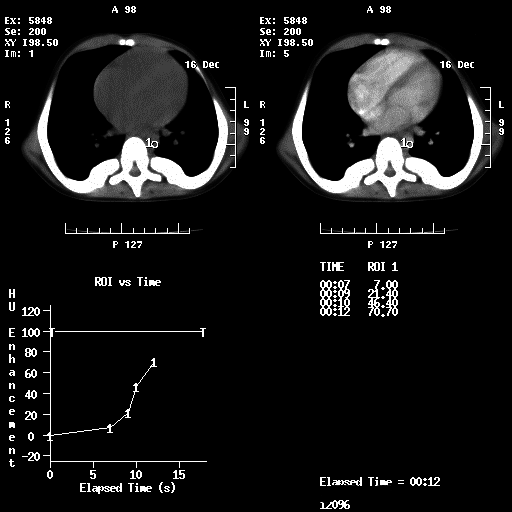 Computed tomography scan of the chest with and without contrast agent. The genetic test detecting the presence of the most frequent mutation in the Russian population (c.807+5>A) in the TCIRG1gene was conducted. This mutation was not detected. The diagnosis of autosomal recessive osteopetrosis was based on the patients’ medical history, clinical presentation (hepatosplenomegaly, short stature, optic nerve, mental retardation) and the results obtained through all laboratory and instrumental methods used. The results of the complete blood count studies showed neutropenia, anemia and thrombocytopenia (Table 1) – which are common features of the bone marrow failure (aplastic anemia). In support of this, the morphological picture of aplastic anemia connected with the substitution of hematopoietic elements of bone marrow by the bone tissue was observed on the trepanobiopsy sample. The results of the biochemical analysis were typical of a liver lesion (elevated enzymes-markers of cytolysis, direct bilirubin) (Table 2). It is supposed to be due to extramedullary hematopoiesis. 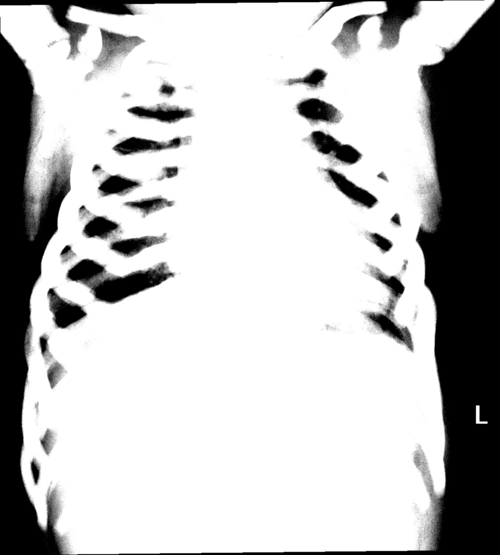 Increased bone density in this patient made the radiograph typical of osteopetrosis (Figure 1). The changes visualized on the chest computed tomography scan were related to the ARO (Figure 2). After the diagnosis was made, it was decided to conduct a bone marrow transplantation (BMT), because this was the only remedial method. Allogenic BMT was carried out from an HLA-identical donor. There were no side effects during the myeloinfusion and after transplantation. The last transfusion was performed on the 63rd day after BMT. The bone marrow fully regenerated. There are no symptoms of the disease nowadays. Establishing the diagnosis of ARO is not usually a problem because of its florid early clinical presentation, so the diagnosis in the early childhood is possible. But the disease should be differentiated from the range of other pathologies such as myeloproliferative diseases, hypoparathyroidism, Paget disease, lead toxicity, different inherited syndromes, and in some cases the diagnosis is not so obvious. Recognizing a disease can be really challenging in such cases. This case is one of the examples of the difficult and time-consuming diagnosis. This Caucasian boy was not born in the endemic region and is not of Chuvash or Mari ethnic origin. The typical mutation for ARO in Russia (c.807+5>A in TCIRG1gene) was not found. Thus, this case of ARO is considered to be unique. The case of intermediate autosomal-recessive form of osteopetrosis in the six-year-old boy was reported. There is rather typical clinical presentation, but several unique features are obvious. This case is an example of late diagnosis and long period without treatment with the diverse clinical presentation. Besides, this boy was not from the Chuvash ethnic group, which is mostly affected by ADO, and the common mutation c.807+5>A in TCIRG1gene wasn’t detected. The authors declare that they have no competing interests. Written informed consent was obtained from the patient for publication of this case report and any accompanying images. The article is edited for English by Yulia Gavrilenko, International Department of Federal Research Center of Pediatric Hematology, Oncology and Immunology named after Dmitry Rogachev, the Ministry of Health of Russia, Moscow. Author Irina Spichak was added after the acceptance and publication of this manuscript at Research. Sakharovskaya EL, Reznik IB, Dubrovin MM, Pavlova GP, Shcherbina AYu: Radiological features of malignant osteopetrosis at early and late stages of disease. Onkogematologija. 2012;4:43-47. Belozertseva LV, Shchadneva SI, Katkova MI, Skatova OV, Parkhomenko YuV, Kalyagin A: Osteopetrosis (marble bone disease). Sovremennaja revmatologija. 2014;1:23-26. Zinchenko RA, El'chinova GI, Kozlova SI: Epidemiology of hereditary diseases in the Republic of Chuvashia. Medicinskaja genetika. 2002;1:24-33. Ginter EK, Kirillov AG, Rogaev EI. Autosomal recessive osteopetrosis in Chuvashia. Genetika. 2001;37:1152-1155.